I’ve always got some lean pork mince in the freezer and this week I fancied trying something new with it. These meatballs were just what we fancied. 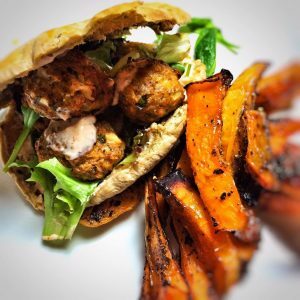 Easy to throw together and lovely and informal to eat, they are the perfect quick tea. If you want to make this even quicker, pop the meatball mix together, roll and chill the night before and its ready to cook the next day! Take the butternut squash, peel and cut into wedges. Par boil the wedges for 5 minutes until they start to soften then drain, pop onto a warmed baking tray, spray with 1kal, season and pop in the oven for 35-45 minutes (until cooked through and starting to crisp up a little). Meanwhile, in a large bowl add all of the meatball ingredients. Mix until well combined and then using either your hands or, if you have one, a meatball press (I got mine from eBay and it was really good value! ), form the mixture into small bitesized meatballs, rolling in your palms until nicely shaped. This should make around 20 small meatballs. Pop the meatballs in a single layer on a plate and pop in the fridge to chill for 10 minutes. 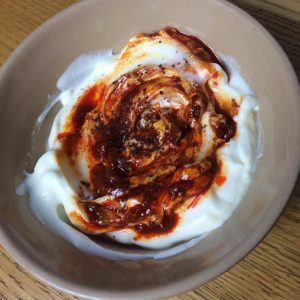 In a small bowl, mix together the yoghurt, lemon juice and 1/2 tbsp harissa. In a baking dish, scatter the aubergine and red pepper, season and spray with 1kal. Top with the chilled meatballs and then, when the wedges have 20 minutes left, add to the oven. Bake meatballs and vegetables for 15-20 minutes until the meatballs are cooked through. Make sure you turn the meatballs, vegetables and butternut squash as its cooking. When everything is cooked, remove from the oven and begin to build the pittas. You can either pop everything in the middle of table and help yourselves or construct and plate up as follows: toast the pitta, split and then stuff with a few salad leaves, a dollop of the lemony harrisa yoghurt, some roasted aubergine and red pepper and a 1/4 of the meatballs per pitta. Serve with the BNS wedges on the side.